L’Echo À Travers Le Clos is southwest Louisiana native-Los Angeles transplant Joe Fontenot’s first record and a very important and an extraordinary celebration of traditional Creole music & culture. Some 30 years ago, I was playing locally in Irish Trad. and CowPunk bands with a button accordionist friend who turned us all on to the regional accordion music of south Texas and southwest Louisiana. In amidst the carefully produced and arranged Norteño, Cajun and Zydeco recordings were some beautifully simple, bluesy and captivating recordings by traditional Creole fiddler and singer Canray Fontenot. At the time, Cajun culture, cuisine and music were enjoying some minor attention in mainstream American culture and there was a sudden burst of Cajun and Zydeco recordings, finding their way into local record stores. Despite this, the rich traditional Creole music of southwest Louisiana remained largely overlooked. Over the past few decades, additional recordings of pre-Zydeco, Creole “La La”, or what Ann Savoy in Cajun Music: A Reflection of a People calls “Old Time Creole” music, have emerged. Notably re-issues of seminal figures like accordionist Amédé Ardoin from the late 1920s and 1930s; Les Frères Carrière, Lawtell Playboys and the duets of Alphonse “Bois Sec” Ardoin and Canray Fontenot from the 1960s and 1970s. That said, this is still a widely ignored and often misunderstood genre and so Joe Fontenot’s L’Echo À Travers Le Clos, is an especially precious and important addition to this lean body of recorded work. Joe Fontenot was born in 1934 into a large Creole family in the rice growing prairie community of Jean Rand near Mamou, Louisiana. The Fontenots had strong connections with the above-mentioned Creole musicians operating throughout southwest Louisiana during the early and mid-1900s and Joe was immersed in traditional Creole French song, accordion and fiddle music since birth. Joe taught himself guitar and harmonica by the age of 13 and when he re-settled to Los Angeles in 1955, Joe initially played guitar back up at Creole house parties and dances. 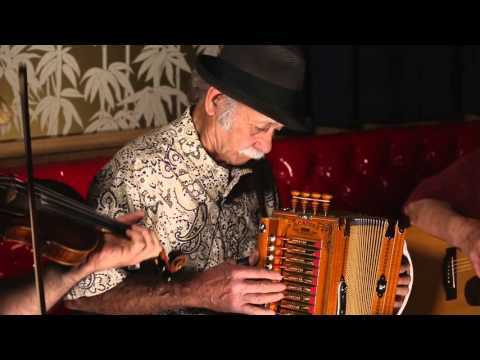 It was not until his mid-50s that Joe played his first dance as an accordion player and bandleader and he has continued to play as a beloved fixture in the Los Angeles Creole community for over 30 years. L’Echo À Travers Le Clos features Joe Fontenot on single row button accordions and vocals in Creole French. Joe is accompanied by Carolyn Russell who has been playing Cajun and Creole rhythm guitar for most of her life. Guy Wenzel, whose Creole family originally came from Plaucheville to New Orleans, joins on fiddle; crediting Joe for encouraging him to join in and play at local house parties early on. On L’Echo À Travers Le Clos, you will hear some brilliantly executed old Creole repertoire in an honest, earthy straightforward style harking back to the community dances and house parties of early-mid 20th century Louisiana, and of course, Joe’s adopted home of Los Angeles. From the classic Amédé 2 Step and Bébé Carrière’s Blue Runner; to the beautiful waltzes Grand Mamou and La Valse d’Evangaline; to Joe and Guy’s original Parking Lot Stomp, composed in a parking lot in Long Beach before a dance; this is an important and wonderful addition to the small canon of southwest Louisiana Creole traditional music. L’Echo À Travers Le Clos marks the 5th release from David Bragger’s and Rick Hocutt’s Old-Time Tiki Parlour and can be purchased on the website. Pat Mac Swyney is a local musician and teacher who currently plays Traditional Jazz with The SWING RIOTS Quirktette; Old Time with The DEAD ROOSTER Memorial String Band; and Balkan with NEVENKA.